Prepayment via bank transfer is a must for starting the process. Second part of prepayment via bank transfer is a must before donor starts preparation with medications. Second payment must be done about 4-5 weeks before the (procedure of) embryo transfer. Using an egg donor you have to pay 1850 EUR in advance to book a donor. 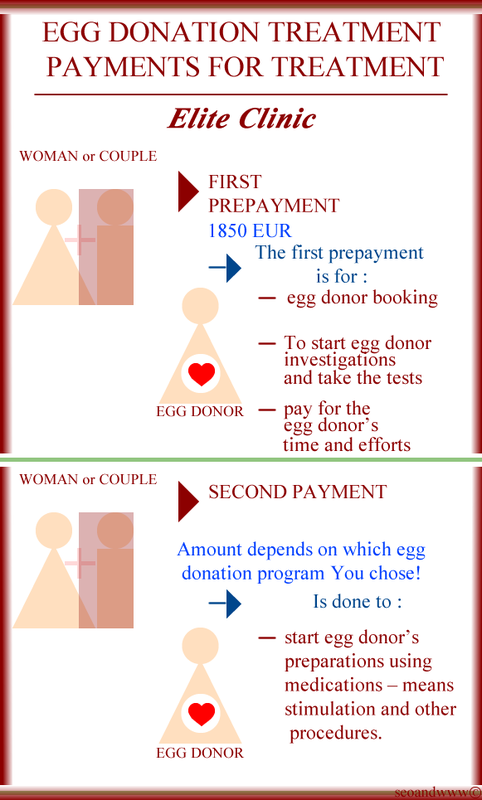 pay for egg donor’s time and efforts. start egg donor’s preparations using medications – means stimulation and other procedures. That means we start to prepare an egg donor for your procedure. That is the reason we ask second payment before your time of ET (embryo transfer). In case of frozen embryo transfer (FET), you have to pay 1900 EUR before starting preparation with medications. Prepayment must be done via bank transfer. Please confirm all payments via e-mail to info@elitekliinik.ee . If Clinic Elite needs to cancel the process and that is our fault, You get your money back or next time for free. Our fault means also donor’s fault. You will get new donor for free. – What happens if produced eggs are not of good quality? Do we get next treatment for free or do we need to pay for a second donor? If any problem with donor’s oocytes – next cycle is for free. – What happens if the donor’s eggs don’t fertilize and sperm is of good quality? Do we get next treatment for free or do we need to pay for a second donor? We are responsible for fertilization if we perform ICSI – in these cases, if no fertilization, next cycle is for free. We are not responsible if we perform IVF – absence of fertilization could depend on the sperm that is indication for ICSI. – What happens if fertilization with donor’s eggs doesn’t happen due to poor sperm quality? We can offer you to use, if your partner agrees also, sperm donor for some part of oocytes (that is decided by you and your partner together). – What happens if fertilization is done but only one embryo is of good quality (to be transferred)? Rule is that if something happens to donor (she does not use medication correctly, she has wrong reaction to medication, has a car accident, will be sick or decides to stop donating for personal reasons), it is responsibility of Elite Clinic and we will pay you your money back or clinic will pay for new donor’s preparation (if you prefer that). Elite Clinic returns 90% of prepayment for frozen embryo transfer (program FET) if the embryos did not survive after thawing or are not good enough for embryo transfer. In this case it is also possible to use frozen embryos donated by other couples for no additional cost. – What more in details are the rules for cancelling the treatment (dates and percentage of reimbursement)? In case you want to cancel after donor investigation, if donor is ready for stimulation, you loose first payment (1850 EUR). Then you pay second (meaning last payment) for stimulation. If you want to cancel, when treatment of donor has already started, you loose all your money (in case of ICSI, we give you back money that you have paid for ICSI). Or in case of your wish and permission, we can continue preparations of egg donor, perform an ovum pick up, perform fertilisation using your husband’s or spermdonor’s sperm and freeze the embryos. You can use the embryos during next 7 years. For example if patient (recipient) has a car accident (we have had this situation in our practice!) and patient cannot come on time, Elite Clinic is not responsible for these kind of situations. If recipient does not have menstruation on time or there is something else wrong with recipient (does not follow the instruction, does not use correctly medication, reaction to medication is not correct, has an accident, will be sick and cannot come, will be late to plane, boat etc and misses it or recipient or her partner cannot come on time), recipient will loose her money and the amount of money depends on the moment we need to cancel the program. Elite Clinic does not return your payment for storage of embryos if the embryos did not survive after thawing or are not good enough for embryo transfer. According to Elite Clinic’s cancellation policy recipient looses 10% of the payment when recipient cancels or postpones FET programme before the frozen embryos are thawed. If recipient decides to cancel FET when the frozen embryos have already been thawed then the recipient looses the whole payment.